Unlike a TV in which the screen is already built-in when considering the purchase of a video projector, also need to purchase a separate screen in order to see your images. Before purchasing a video projector and screen, take a good look at the room you will be placing them in. Make sure the room is of sufficient size to project a large image on the wall area where you intend to place your screen. Although resolution, connection offerings, and lens positioning tools are important in video projectors, they also need sufficient white and color light output to project a bright image on your screen. Without enough light output, an image will look muddy and soft, even in a dark room. To determine if a projector outputs enough light to produce bright images, check the ANSI Lumens rating. This will indicate how much light that a projector can put out. A projector with 1,000 ANSI Lumens or greater have sufficient brightness for home theater use. The type of lens used by the projector, as well as the projector-to-screen distance, determines how large an image can be projected on the screen. This helps the viewer to determine the optimal seating position in relation to the screen. The size of the screen image from a specific distance is determined by the projector's Throw Ratio. Some projectors require a large distance, while others can be placed very close to the screen (Short Throw). Due to the popularity of widescreen content sources and display technologies such as DVD, HD/Ultra HD TV, and Blu-ray/Ultra HD Blu-ray Disc, video projection screens also mirror that trend with a 16x9 screen aspect ratio. This screen design accommodates widescreen programming display on all, or most, of the actual screen surface area, while the 4x3 design will result in a larger unused screen surface area when viewing widescreen programming. However, the 4x3 design will allow the projection of a much larger 4x3 image, which would fill the entire screen surface. Some screens are available in very wide 2.35:1 aspect ratio and some screens designed for custom installation use can be "masked off" to display a 4x3, 16x9, or 2.35:1 Aspect ratios. Most video projectors designated as Home Theater or Home Cinema Projectors project a native 16x9 aspect ratio image. However, they can be configured for 4x3 display, and, in some cases, can also be configured for a wider 2.35:1 aspect ratio. Most Video projectors can be configured to project an image from either the front or rear of the screen and can table or ceiling mounted. Front projection is the most common, and the easiest to set up. If you need or want to place your projector close to the screen, or you prefer to project the image onto the screen from the rear, it is advisable to get a short throw projector that was discussed previously. There are several types of screens to accommodate different installation needs. If you are planning to construct or use a room as a dedicated home theater room, you have the option of installing a screen on the wall permanently. These types of screens are usually referred to as "Fixed Frame" as the actual screen surface material is placed within a solid wood, metal, or plastic frame so that it is always exposed and cannot be rolled up. In this type of screen installation, it is common to also install curtains in front of the screen to hide and protect the screen surface when not in use. This type of screen installation is also the most expensive. A pull-down screen can be semi-permanently mounted on a wall and can be pulled down when in use and then raised up into a protective housing when not in use. This way you can still have other items on the wall, such as paintings or other decorations, when not viewing the video projector. When the screen is in use it simply covers the permanent wall decorations. Some pull-down screens allow the screen case to be mounted in the ceiling instead of having to be mounted on the wall externally. Some pull-down screens are motorized. The least expensive option is the totally portable screen. One advantage of a portable screen is that you can set it up in different rooms, or even outdoors if your projector is also portable. The drawback is that you have to do more adjusting of the screen and the projector every time you set it up. Portable screens may come in a pull-up, pull-down, or pull-out configurations. Video projection screens are made to reflect as much light as possible to produce a bright image in a specific type of environment. To accomplish this, screens are made of various materials. The type of screen material used determines the Screen Gain, ambient light rejection (ALR), and viewing angle characteristics of the screen. Also, another type of projection screen in use is the Black Diamond from Screen Innovations. This type of screen actually has a black surface (analogous to black screens on TVs — however, the material is different). Although this seems counter-intuitive for a projection screen, the materials used actually allow projected images to be viewed in a brightly lit room. For more details, check out the Official Screen Innovations Black Diamond Product Page. Another thing to consider is if you are going to place speakers behind the screen (either in the wall or free-standing with the screen set forward), you need to make sure that your screen is acoustically transparent. Unlike most screens, an acoustically transparent screen employs "fabric" that is woven or perforated in such a way that sound passes through tiny holes. This allows the sound to come clear, but there may be a slight sacrifice in overall picture quality and some of the light from the projector leaks through the holds and doesn't get reflected back to the view. Projector screen manufacturers have their own trademarked terms for the materials they use in their screens. When shopping for a screen, focus on how the manufacturer designates which screen material they offer would work best for your room environment. 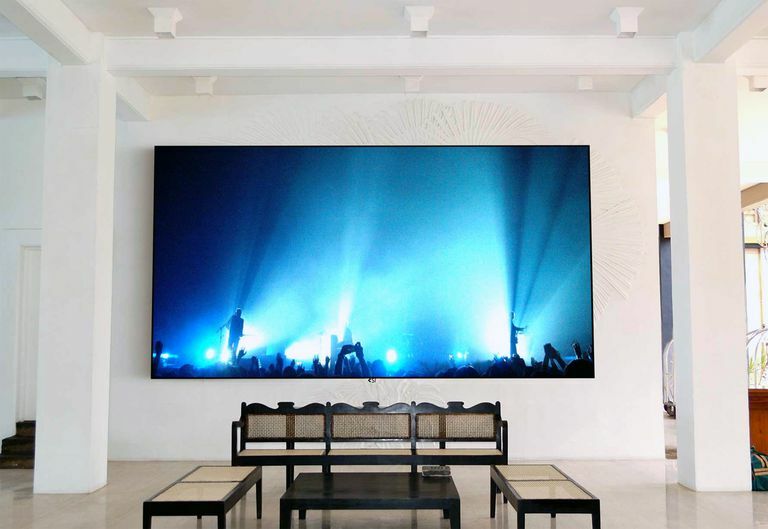 Although a well-matched screen provides the best image display experience for a video projector, with some of today's higher-brightness projectors (projectors that can output 2,000 lumens light output or higher), you can opt to project images on a blank white wall, or cover your wall surface with special paint designed to provide the right amount of light reflection. Outdoor or backyard home theater is a popular way to use a video projector and screen. However, there are some additional things to take into consideration. Since these screen installations are temporary or seasonal, you can use something as basic as a white bedsheet, outside wall, or portable screen, but there are options that will provide better quality such as an inflatable screen or one that can be mounted within a frame with a standard and/or anchor wires/spikes that can be quickly set up and taken down. The key thing is that the screen assembly is sturdy and the screen material is easy to maintain. The information above covers what you need to know before purchasing a video projection screen for most video projector setup needs. However, unless you are going with a portable or non-permanent installation, it is advisable to also consult with a home theater dealer/installer that can come out to evaluate your room environment in order to assemble the projector/screen combination that will provide the best possible viewing experience for yourself and other viewers.